We are pleased to welcome you to the All-Action Taekwondo Club. We have registered Instructors including a world bronze medalist and world championship coach who teach children and adults Olympic Martial Arts skills in a family, well supervised and fun environment or on a one to one basis. Our Instructors have attended recognized child protection courses run by the British Taekwondo Council Board and have been DBS (formerly CRB) checked. Our instructors are winners of numerous domestic & International competitions and have coached British & international champions including children and adults. We believe everyone has ability. It’s just a matter of tapping into it. We’ll teach you how. Taekwondo originates from Korea. In Korean, tae (태, 跆) means “to strike or break with foot”; kwon (권, 拳) means “to strike or break with fist”; and do (도, 道) means “way”, “method”, or “path”. Thus, Taekwondo may be loosely translated as “the way of the hand and the foot.” Taekwondo is the world’s most widely practice martial art. It is an Olympic sport, an artistic discipline, a system of self-defense, and a way of life. Taekwondo is a fun and challenging activity, enjoyed by numerous people of all ages. 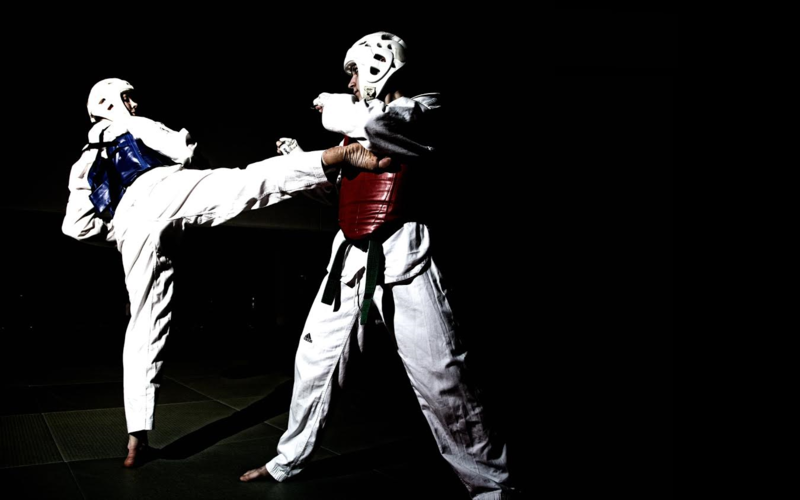 Taekwondo helps improve fitness levels, balance, coordination and flexibility. For those not wanting to take part in combat, the moves involved in the sport can still be done as conditioning and strength-building exercises. The moves involved in Taekwondo often require your arms and legs to work together in unison, while using a number of different muscle groups at the same time. For example, upright kicking moves require flexibility in the legs, plus core and spinal strength. The strikes and evasive manoeuvres involved provide an effective form of self-defence training. It also lowers peoples risk of sustaining serious injury in other sports as Taekwondo teaches people how to fall in a safe manner. Although it is an individual sport, Taekwondo is an excellent way to develop communication skills and learn to work effectively with other people as you train in groups. Taekwondo is good for the mind as well as the body. Specific rules ensure you will build self-confidence, self-discipline and respect for yourself and others. There are several ways to get involved in Taekwondo beyond the sparring sessions. Poomsae is a non-combat version whereby a Taekwondo instructor runs people through a sequence of moves and attacks. Vestibulum ac diam sit amet quam vehicula elementum sed sit amet dui. Curabitur aliquet quam id dui posuere blandit. Curabitur aliquet quam id dui posuere blandit.